Drew Peterson takes murder conviction appeal to Illinois Supreme Court. Murder-for-hire trial set for next month. UPDATE 1/27/16: Despite having denied a motion to delay the beginning of the trial just last week, after a conference call between Judge Brown and attorneys Walker and Liefer, the judge agreed to continue Drew Peterson’s upcoming murder-for-hire trial in order to give both sides more time to prepare. The trial was originally set to begin the end of next month. The new trial date is May 6. Two months after his appeal was denied by the Illinois appellate court, Drew Peterson’s attorneys have taken his case to the state Supreme Court in hopes of overturning his 2012 conviction for the murder of his third wife, Kathleen Savio. Penned by attorneys Steve Greenberg and Harold Krent, the petition to appeal covers familiar ground, alleging that the admission of hearsay and “former bad acts” evidence to his the trial should not have taken place and resulted in the erroneous conviction of Drew Peterson. The Illinois Appellate Court is also called out for having not seriously considered all of the arguments raised in the earlier appeal. The appeal also, once again points the finger at Peterson’s former counsel and friend, Joel Brodsky, who they insist created a conflict of interest when he wrote a contract with Peterson that gave him a percentage of any money earned by media appearances. They also maintain that he erred when calling lawyer Harry Smith to the stand to testify that Peterson’s fourth wife, Stacy, had asked him if she could get more money from a divorce arrangement if she threatened to tell how he had killed Kathleen Savio. Interestingly, last week, a former client of Steve Greenberg’s, Albert Domagala, had his sentence overturned and was granted a new trial after a judge agreed that he had been granted ineffective assistance by Greenberg at his 2005 murder trial. Joel Brodsky, naturally, took to Facebook and called it a case of “the pot calling the kettle black”. Meanwhile, on Tuesday, Randolph County Circuit Court Judge Richard A. Brown denied Peterson’s request to delay his trial in the solicitation of murder case. Peterson’s attorney, Lucas Liefer told the judge that the defense and prosecution were still exchanging discovery in the case, “I don’t think we need a lot of time, but I don’t think it is realistic to say we will be ready to go to trial in a month,” he said. At least forty-six witnesses have been subpoenaed in the case, including experts in finger-print and audio recording evidence. Jury selection for the trial will take place on February 26 and his trial will begin on February 29th in Chester, Illinois where he is incarcerated. Drew’s prison correspondence continues to be of interest. Joel Brodsky took to Twitter to share his taunting of his former client via the postal service. A man (with his own notorious past) who claims to be distantly related to Staacy Peterson, also wrote to Peterson in prison, and claims to have received an acerbic reply. Stacy’s sister, Cassandra Cales, continues to search for her sister and to consult those claiming to be psychics for help in locating Stacy Peterson’s remains. Most recently Stacy’s family has turned to a woman named Sharon Pugh, who calls herself the “Southern Style Medium”. Hugh was provided with items belonging to to Drew and Stacy Peterson, and by holding the items she says that Stacy joined them and told her that she had been wearing a heart shaped necklace when she died, which was removed before the disposal of her body. She hopes to have more sessions with the family. Today is Stacy Peterson’s birthday. She would have been 32. Her youngest child turned 11 this month and celebrated with a trip to an indoor rock climbing facility and a lobster dinner. This morning at a court appearance in Chester, Illinois, Drew Peterson waived a preliminary hearing and pleaded not guilty to having attempted to arrange the murder of State’s Attorney, James Glasgow. Two subpoenaed FBI agents (I believe their names to be Brian Clark and Chris Straub) did not testify today since the hearing was waived. Steve Nate from the Attorney General’s Office argued a motion for an order prohibiting Peterson’s attorneys and prosecutors from disclosing to the public any evidence in the case, which was granted. This was most likely filed to protect the identity of the jailhouse “snitch”, who is reported to have been a fellow inmate of Peterson’s, and outed in letters from another inmate as Antonio Smith. Last month, Peterson’s former attorney, Joel Brodsky, released those letters from inmate Adrian Gabriel, who claimed to have hatched a plan with Smith to set up Peterson with the solicitation charges. Brodsky says that Smith is presently under witness protection and living in Florida under an assumed name. The state also filed a notice disclosing that Peterson’s case twice involved use of eavesdropping devices. Peterson is next expected in court on April 14 for a case management conference and the case has also been placed on the July 2015 jury docket in Randolph County. Stacy Peterson’s sister, Cassandra Cales, was in attendance. Peterson’s new attorney, Lucas Leifer, says that he and his client do not want to try this case in public. Seven Years Later: Where is Stacy Peterson? Stacy Peterson with her children and those of Kathleen Savio. Stacy Peterson was last heard from seven years ago, today. At 10:15 on a lazy Sunday morning she texted a friend that she wasn’t ready to get out of bed to go help with some painting and then…silence. No more texts, no phone calls, no email, no sightings of her since that moment. Her sister, Cassandra Cales, hung out with her the night before and was already nervous about Stacy’s well-being. She knew that Stacy wanted to divorce her police officer husband, Drew, but also that she was afraid he wouldn’t let her go. Stacy warned her sister that night that if something were to happen to her “he did it.” Her neighbor, Sharon Bychowski, saw her sitting on the curb and crying in the days prior to her disappearance and Stacy told her then that she had lost hope of making it out of the marriage alive. Stacy had confided a terrible secret to at least three people in the weeks prior to her disappearance – her husband had killed his third wife and had staged her death to look like an accident. She hoped that this dangerous information might buy her and her children an escape from Drew, but it probably cost her her life instead. The night of October 28, 2007, Drew Peterson’s step-brother visited a friend and told him that he needed to unburden himself. He thought that he had just helped move a plastic container that held the body of Stacy Peterson from her house to Drew’s SUV. He had been given some money and he wanted to give some of it to his friend. The next day he attempted to take his own life with an overdose of Paxil, Xanax and alcohol. Drew Peterson was eventually charged, tried and convicted for the murder of his third wife, Kathleen Savio, but he has maintained to this day that Stacy Peterson simply left him and her children on that Sunday, seven years ago. Numerous land and water searches have failed to turn up any evidence of her remains. Her sister, Cassandra, still searches for her with the assistance of volunteers. 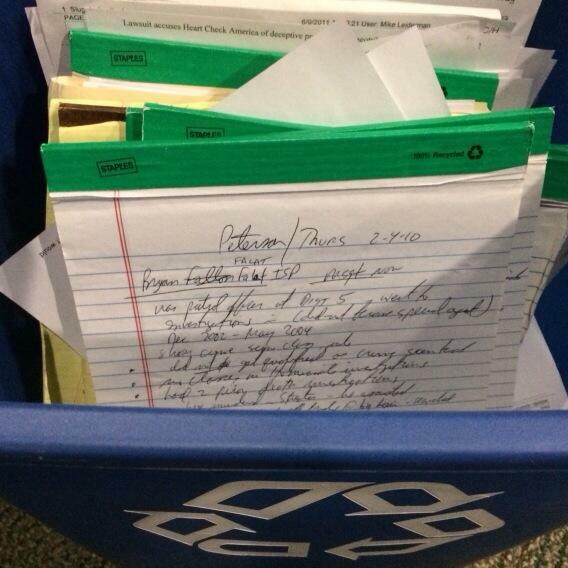 Reporter Craig Wall tweeted this photo of his notes from Drew Peterson’s 2012 trial ready for recycling. Drew Peterson filed an appeal of his murder conviction in January of this year but is still awaiting a date in court for oral arguments. In March, The Bolingbrook Police Pension Board voted to hold hearings to determine whether Drew Peterson should lose his retirement pension (but no vote has happened yet). Also in March, the Illinois Supreme Court denied Stephen Peterson’s request to appeal the Appellate Court decision that upheld the Village of Oak Brook’s decision to terminate him from his position with the Police Department. In April, Walter Martinek, the friend who heard Tom Morphey’s confession about helping to move Stacy’s body, was killed in an auto accident. The Savio’s wrongful death suit against Drew was continued until January, 2015. In May, Stacy’s brother, Yelton, completed a prison sentence and was released. In July, Cassandra made public her intention to file paperwork to get Stacy legally declared dead, but today family spokesperson said they have changed their minds as they don’t want to risk Drew Peterson being able to collect on Stacy’s life insurance policy. As of today Cassandra is still searching for her sister. Stacy’s Aunt Candace wrote a poem to commemorate the anniversary of the disappearance (used with her permission). And still no answer to our fears! And your special endearing touch! Its hard to know where to pick up and restart! because not one can take your place! You were so precious and so dear! And your voice I love the sound! How many times I call you, I never tell! But then, it’s only your message I can play! And to your house, I love to go! In my heart, you’re always near! Although I don’t know exactly when! Because God has ordained it that way!!!! I love and miss you Stacy Ann!!! Today is the anniversary of Stacy Peterson’s disappearance. In observance I am re-running a blog post from a year ago. Stacy Peterson is still much in the thoughts of those who knew her and they are still seeking answers about her whereabouts. If you have any information that can help this ongoing investigation, please contact the Illinois State Police. Stacy Peterson was last heard from six years ago, today. On a lazy Sunday morning, she texted a friend that she wasn’t ready to get out of bed and go help with some painting and then…silence. No more texts, no phone calls, no email, no sightings of her since that moment. Her sister, Cassandra Cales, had been with her the night before and was already nervous about Stacy’s well-being. She knew that Stacy wanted to divorce her police officer husband, Drew, but that she was afraid he wouldn’t let her go. Her neighbor, Sharon Bychowski, had seen her sitting on the curb and crying in the days prior to her disappearance and had been told that she thought she would not make it out alive. She had confided a terrible secret to at least three people in the weeks before–that her husband had killed his third wife and that she had provided him with an alibi. Stacy thought that this information might buy her and her children an escape from Drew, but it may well have cost her her life instead. During Drew Peterson’s murder trial I received a lot of emails from people–really great emails for the most part filled with support for this site as well as the Savios, the Cales, and the prosecutors. Of course there were a few nutty negative emails as well, but those were expected. But beyond that, there were also a few troubling emails. These came from people who, although they believed Peterson was guilty of killing Kathleen Savio, had difficulty accepting the idea that Stacy knew about her murder but did nothing about it until three years later when she wanted out of her marriage. These emails were from the nicest people you could imagine, who believed that Peterson killed not only Kathleen but Stacy as well, and they asked about this facet of the case tentatively, obviously not comfortable sharing their thoughts in the comments sections of the blog. It’s true that Stacy was not always kind to Kathleen during the first part of their relationship and that she later kept Drew’s dark secret for three years. However, she was only a teenager when they met and was no doubt under a good deal of control by Drew, so I factor that in when I think about her behavior towards Kathleen. I admit with some discomfort that I do find Stacy culpable to a degree for protecting Drew and providing him with an alibi. That said, I guess I don’t dwell on it or feel anger towards her at this point because although I learned those facts of the case very early on, they were so eclipsed by the transgressions of Peterson himself. In our country you have the right to be tried for your crimes and judged by a jury of your peers. Stacy Peterson was robbed of that right while her husband received the full benefit of the legal system. In my opinion, Drew Peterson was Stacy’s self-appointed judge, jury and executioner and he meted out a death sentence not as a matter of justice, but in order to hide a crime of his own. I think someday it will be proven in court that he killed her out of cowardice and greed. No matter what she might have been charged with, the sentence would not have been to be murdered at the hands of someone who had sworn to love and protect her. I never think “shame on Stacy” because she never benefited from her right to representation and never got a fair day in court. She was abruptly silenced and denied the chance to either explain her actions or to defend herself against the slanderous accusations that have been made by Peterson and his lawyers since her disappearance. It’s especially galling when you think about the fact that while Drew Peterson has now been convicted of the murder of Kathleen Savio, he still has parental rights over Stacy’s children and can legally keep her family from spending time with them. Even if you feel that Stacy Peterson deserved punitive measures for not speaking up about the murder sooner, I don’t think there are many who would say that she hasn’t paid the price ten times over and then some. 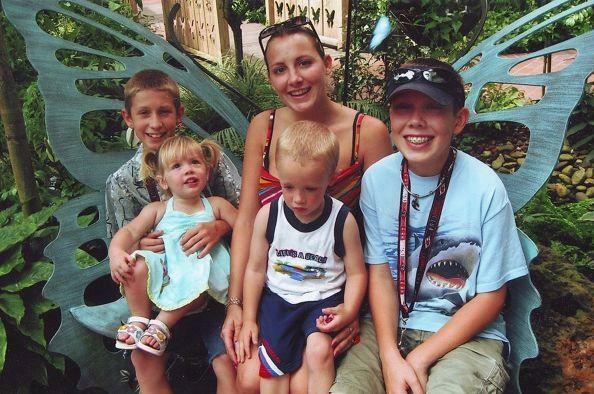 She didn’t deserve to be killed and her children didn’t deserve to be robbed of their mother. I try to take my cue from the Savio family who have found it in their hearts to put aside any resentment and have stood by the Cales to work towards getting justice for both Stacy and Kathleen. If the only people in the world who have a legitimate reason to be angry have demonstrated that they can get over it, so can you. And of course there’s only one appropriate question to ask today: Where is Stacy? It’s been a while since there’s been any big news to report about the Peterson cases but that doesn’t mean nothing has been going on recently. This summer there have been a few filings in the Savio’s wrongful death suit against Drew. Attorneys will be back in court on September 26 for Judge Power’s decision on the Savio’s motion for a summary judgement. In August, prosecutors filed a motion requesting that Steve Greenberg step down from Peterson’s appellate team, claiming that the libel suit brought against Greenberg by Peterson’s ex-counsel, Joel Brodsky, created a conflict of interest for Greenberg. At the time of the filing Greenberg called the claim “absurd”. Yesterday, Greenberg tweeted that Brodsky had withdrawn the libel complaint because he “didn’t comply with the rules (no surprise) and didn’t state a cause of action”. Greenberg went on to tweet that Brodsky has said he is going to re-file but needs to find an attorney to represent him. Meanwhile, Joel Brodsky has shared the contents of some of his letters from Drew Peterson with a local Fox affiliate. He claims to have received nine letters from Peterson and made public a few excerpts from letters he received in March and April (Peterson began his prison sentence in February). The excerpts were complaints about the discomfort of prison life, and worries for his safety. This is consistent with the kind of letters Peterson wrote while in jail while awaiting trial, which he sent to the Sun-Times and other media outlets. As for Peterson, it would appear that he has begun to adjust better to prison life since those April letters. More recently, his correspondents have been reporting that Peterson has started to make use of his popularity as a pen-pal to help out his fellow prisoners by sharing lists of inmates who would like pen-pals and to inquire about correspondence courses. Lastly, rumor has it that Cassandra Cales, sister of missing Stacy Peterson, has just returned from New York, where she consulted a celebrity medium, possibly to be aired as part of a reality show on TLC. An appeal of Drew Peterson’s conviction is expected to be filed within the next 30 days.